Where to Find the Best Pho in Calgary? 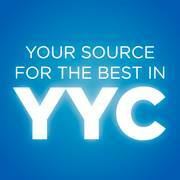 Where will you find the best pho in Calgary? 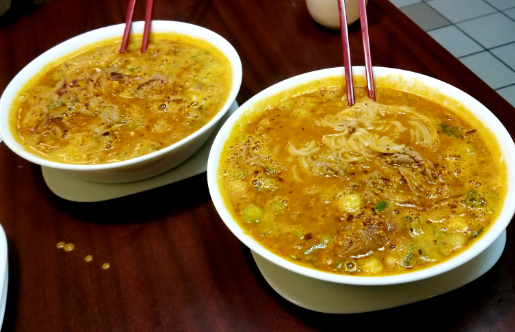 With lots of Vietnamese restaurants open for business in nearly any area of the city, it can be challenging to find one that consistently serves up finger lickin’ good noodle soup every time. Here’s a list of Calgaryism’s favourite Vietnamese restaurants found all over the city. Let us know which ones you like below and we’ll add them to our list of best pho in Calgary! 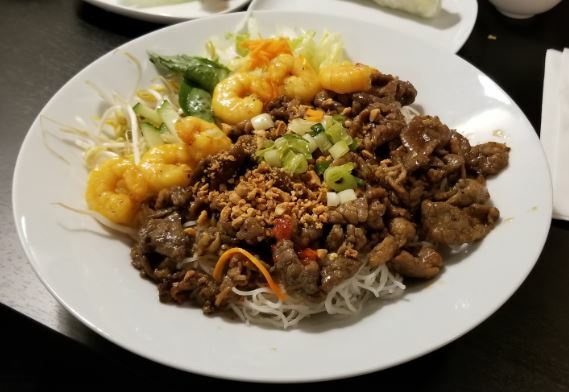 Located around 46th Avenue and Macleod Trail SW, Phu Chu The serves up some of the best Vietnamese cuisine on Macleod Trail South. Serving sizes are always hefty and the food is mouth-watering good every time. This place is a must try if you find yourself near Chinook Mall! 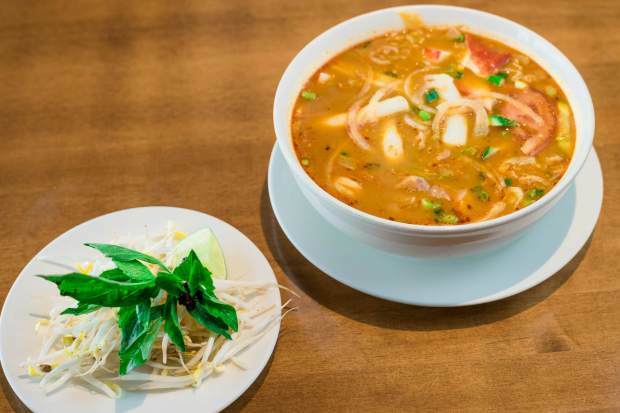 If you’re in love with good peanut sate soups, then you’ll love Van Son’s take on this popular pho bowl. Make sure to add beef balls as an extra; they use high quality beef balls with no gristle that are a good size and soft to eat. Van Son’s consistency has me coming back again and again. You should check this place out for yourself! One of the best things about Co Do is the late hours it’s open ’till every day of the week. Okay, not that late (10pm), but it’s still open an hour after most other pho restaurants close in Calgary. I know I’m not the only one with a late-night pho craving now and then. If you’re in the inner city, this is your spot for some of the best late-night pho in Calgary. Pho Hoai is not only one of the best pho restaurants in Chinatown, but also in the entire downtown area. You’ll have to head indoors to find the storefront, however. 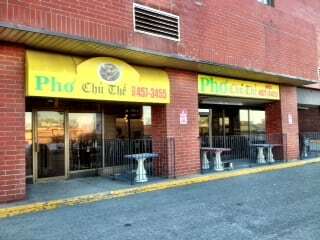 Pho Hoai is located in a shopping plaza just off 1st Street and 3rd Avenue SE on the east end of downtown, adjacent to the Harry Hays building. You simply cannot ever go wrong with Pho Binh Minh. If you live near International Avenue (17th Avenue SE), this Vietnamese restaurant is one of your best bets for the best pho in Calgary’s east quadrants. Be sure to try the beef pho sate soup with extra spice (if you can handle it!). Of all the Vietnamese pho noodle houses I’ve been to in the southeast, Pho Dau Bo is definitely one of the best! 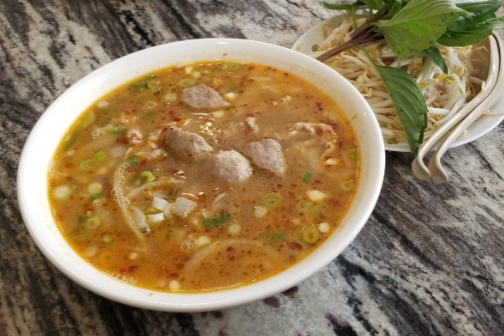 Located in an unsuspecting strip mall off of 17th Avenue between 48th and 50th Street SE (south side of the block), Pho Dau Bo offers delicious peanut satay beef soup as well as bun and traditional rice dishes for you to indulge in, all for a very affordable price! 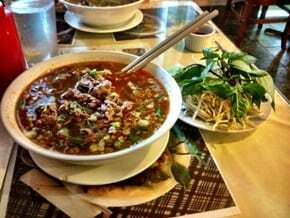 Nho Saigon has one of the best peanut beef sate soups in the city, hands down. 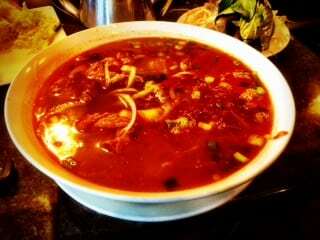 This dish comes with a spicy broth loaded with crunched peanuts and raw beef strips that are cooked in the broth. Sometimes the beef doesn’t cook all the way, which I find is a part of this delectable pho bowl. 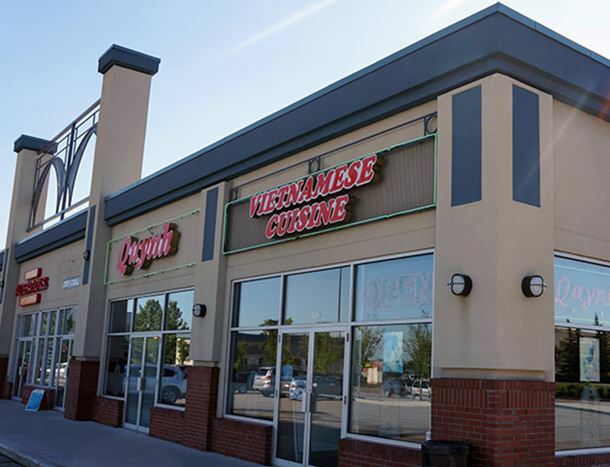 Head on down to its location in Marda Loop if you’re in for some of the best pho in Calgary! 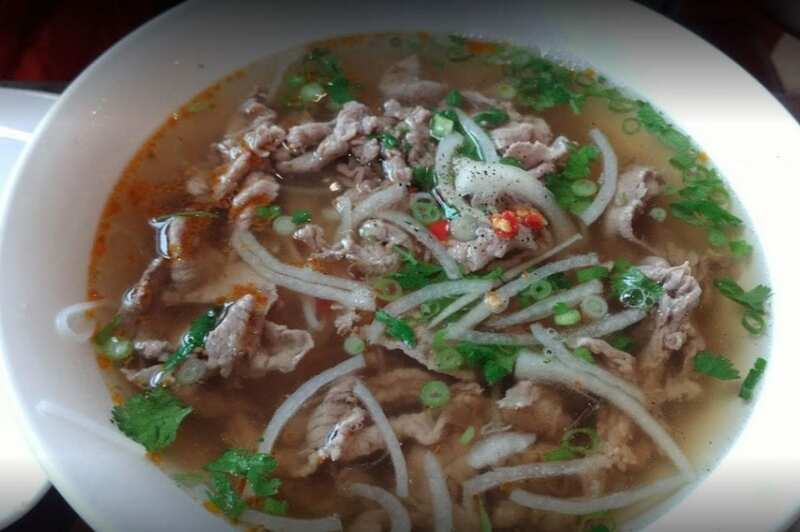 For some of the best pho in Calgary’s northeast, be sure to stop in at Quynh for your favourite Vietnamese dish. If you’re looking for something new, I highly recommend trying the hot and sour chicken soup and / or the yellow chicken curry dish. Absolutely delicious! The atmosphere at Quynh was also renovated somewhat recently and is a delight to dine in! 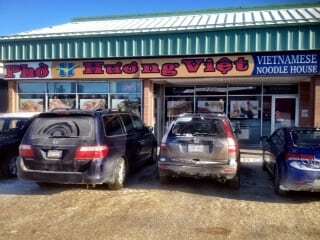 Pho Huong Viet is one of those Vietnamese restaurants in Calgary that’s always busy – a telltale sign of just how good it is. People head here to indulge in some of the best pho in Calgary at all hours of the day. Be prepared to wait, even during downtimes, and more so during the lunch or dinner rush. NOTE: this place is closed on Monday! With a smaller venue than it’s sister location in the southwest, you’ll want to head in between peak times to be seated quickly. Bagolac Saigon is one of the best Vietnamese restaurants in Calgary near Chinook Mall. This place has been open for several years, a true testament to it serving up some of the best pho in the city! Inside you’ll find a contemporary atmosphere and large seating area which can get filled during peak times. But the seating area is so large that your bound to get a seat because of the high turnover rate. 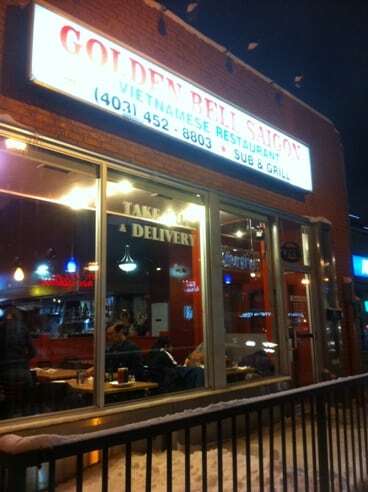 Always get great food with quality tasting ingredients at Golden Bell Saigon on 17th Avenue SW. 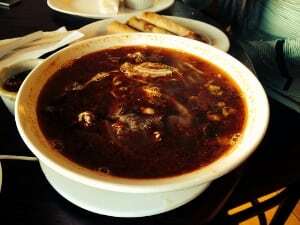 I highly recommend trying the coconut beef sate soup. It truly is one of a kind in the city and is definitely one of the best sate bowls with added flavour you’ll find! If there’s anywhere on Centre Street North to get a good bowl of pho, this is it! Pho Kim has been open for many, many years, a testament to the delicious Vietnamese cuisine it serves. It has ample seating space with a two-floor layout, meaning you won’t have to wait (if at all) to indulge in some of the best pho in Calgary. 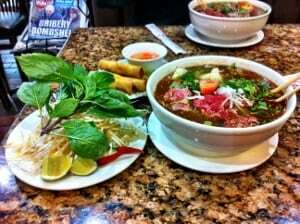 Located in the south end of the city, Saigon Thai Restaurant is a relatively new pho spot with raving reviews. We loved the fact that they offer gluten-free pho soups on most favourites like the beef sate and the beef / beef ball and brisket specials. This restaurant needs to get itself on Zomato! Sometimes new is better. In the Kensington District, that is true when it comes to Pho Houz. Inside this recently opened Vietnamese restaurants you’ll find one of the most contemporary ambiances for its genre. 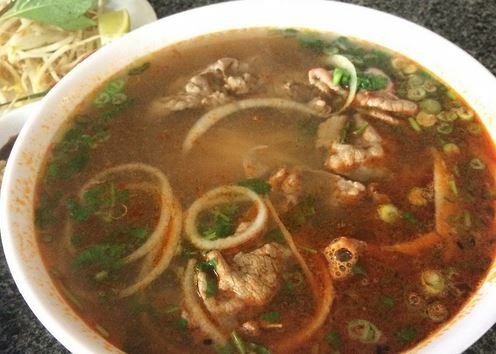 You’ll also find delectable pho and bun dishes that will keep you coming back for more. Pho Houz doesn’t even have a Zomato profile. They need to get on that! For more of the best local activities, events, restaurants and everything else to do with YYC, be sure to give us a like on Facebook, Twitter and Instagram today! We hope to see you there! Have you tried Ha Tien? They are in the southwest, used to be up on memorial and 28th. Fantastic. BOLSA on Macleod and Southland(ish) is amazing food and the owners are some of the nicest people in the world! They know all their repeat guests names and favorite orders and the FOOD……wow soooooo good. I haven’t been to any of your selections but I’ll definitely check them out now! 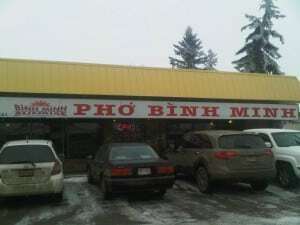 Definately Pho Phuong Vi Noodle House! Pho Phuong Vi Noodle House. well now im hungry! thanks for the recommendation Casey, im going to check it out! CoDo on 17th Ave at 14 St Sw has excellent soups as well as the best salad rolls. Nho Saigon in Marda Loop is amazing! MMMM nho saigon has a great peanut based broth for their sate! great recommendation. Noodle Kings off Barlow’s Sate Beef is the best in the city!! 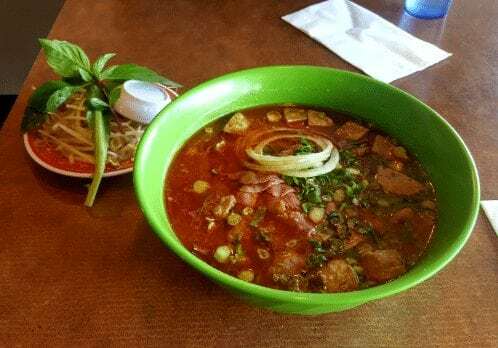 Pho Anh Huyen Noodle House in Cochrane does a curry soup and lemongrass curry bowl that is phenomenal!! Golden Bell on 17th is the best all around I have found will have to try the others ok the list. Meant it was a great list, auto correct.. “Will have to try the others on the list* not ok list, haha. Pho viet huong on 17th ave and 33rd street. They have the best springrolls ever! Also the beef satay pho is incredible. Vietnamese Village in the North East! They have a peanut satay soup that will knock your sandals off. I now travel from Victoria every 3 months just for a bowl of it (I lived in Calgary for 10 years). I’ve been to a few of the places mentioned. I’ve been going to Pho Hoai at 132 3 Ave SE for more than 15 years. The rare beef satay pho is amazing. Have you try SAIGON STAR VIETNAMESE RESTAURANT located across Foothill hospital. They offer Best PHO, VERMICELLI and SUB in town, Especially there are NO MSG on any soup compare other vietnamese Restaurant which most of them have..
Golden Bell Saigon is one of my favourite places in the city! I usually visit the Richmond Rd Location in Glamorgan, right across from Westhills Centre. Amazing food and amazing prices! I love that you can schedule your order for pick up or delivery online. I know this article is old but if you’re like me looking for new places to try and you haven’t been to Golden Bell, check it out! I added their website above.